Hydrogen gas is one of the most important gases in the area of industry. Some of its many applications include: syngas (synthetic gas), metallurgy, welding, petrochemical, fertilizer, etc. Verde LLC has developed its hydrogen generator for many years, and features multiple core technologies that adapt to and efficiently take advantage of unstable and intermittent renewable power sources (wind/solar). The DC power consumption of VERDE hydrogen plant is 4.2 KWh/Nm3 H2. VERDE hydrogen plant connect with wind turbine/solar panel though renewable power converter. (Connect with national grid is an optional choice for extra generation). 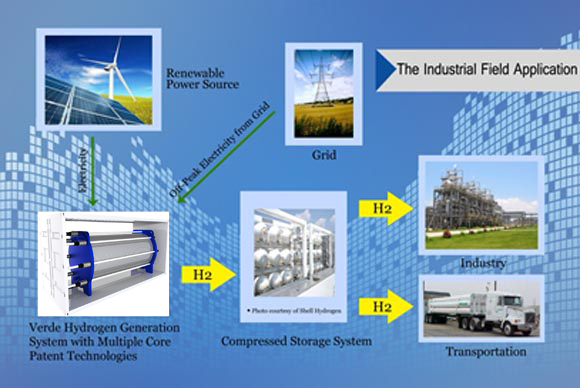 VERDE hydrogen plant generate high purity hydrogen gas (>99.999%) with zero greenhouse gas emissions, for industrial applications or transportation/industrial vehicles. The entire system of VERDE hydrogen plant is automatically controlled. The life cycle of the plant is more than 30 years. Verde LLC has long standing cooperation with many companies involved in wind turbine/solar panel production, storage systems and renewable energy. Please feel free to contact us for more information about hydrogen solution at +1-781-519-4765 or email us at sales@verdellc.com.